This year's picks validate the quote: "Just because you CAN make something doesn't mean you should". 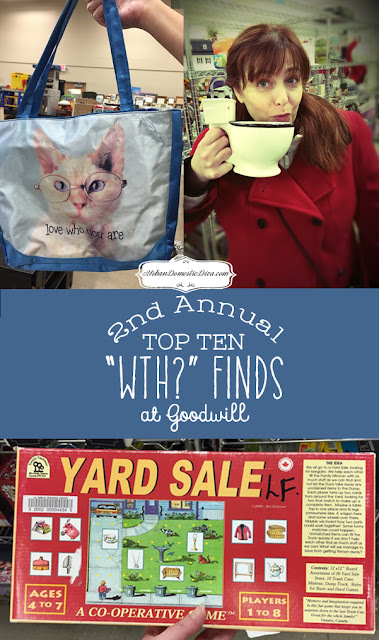 I am a BIG thrifter, and you can certainly find some great treasures. But there is also no shortage of crap, the whole reason stuff is given away in the first place, right? It takes patience and a trained eye to pick through the crap for treasure. My friends and I during our annual Girl Scout leader retreat visit a Wisconsin Goodwill to see what we can find, and try and find the most ridiculous things for a good laugh, and share them with you. Ok, I want to say that first, I am first generation Italian, so the amount of Catholic “bling” I grew up wearing or was around would make the Vatican jealous. St. Christopher’s medals, golden crosses in various metals and stones, Virgin Mary charms…the religious accessory list goes on. I don’t have a problem wearing religion, just do it tastefully and stylishly. This is neither. Looks more like a Tim Burton Halloween prop. This looks like zombie apocalypse meets the a gingerbread house. We think it may hold spoons in the hole the arms make, which will look like it’s getting impaled. Beyond the frightening design, it’s not very functional if it can only hold 2 utensils. So what's more disturbing, this creepy hobo looking guy thrusting up in the air, using a "tree" for support, the weird inappropriate "bulge" in his pants, the hybrid clown-hobo face, or the fact that you need to hold him to drink whatever you would put in this thing? This is pretty self explanatory. I mean. WOW. However, this turned into a valentine gift/joke for one my friends for her husband, complete with Raisenettes. It was well received and the kids thought it was hilarious. Kudos to their relationship! My husband would not talk to me for a week if I gave him that. We couldn't figure what Ziggy was doing, and how functional this thing was. I kept thinking Ziggy was about to dumpster dive into a garbage can. Our conclusion was a pool, as a "cup". A very very small....cup. Lisa found this box labeled "mask vase". We then opened it up, and sure enough, a creepy, small mask vase was nestled inside. I cannot think what kind of flowers you would put in this thing. It's very short, and not very wide. And any flower you would put in here would completely clash with the tasteful color palette painted on this wonderful piece of art for your home. How META, finding a yard sale game at a thrift shop? Gather the kids together Friday night to play YARD SALE! The objective, find as much stuff as you can so none of it gets thrown away. Thus the reason why Hoarders is a much watched TV show. Ok. Cats are fun on the Internet. But on a big, style'n purse? With groovy glasses? Do you get a "Hang in there" cat poster as a gift with purchase? You are reading this right. No need to rub your eyeballs. This is the "Potty Golfer". Skip the fishing magazines for the hubby, and get this! What if the ball goes too far while doing your business? Don't think too hard about it. You'll throw up in your mouth a little bit. This sweater looks like a yarn garden threw up all over it. I saw later in the day a paper gift bag and a pillow that looked much like this. It looked much better on a pillow.